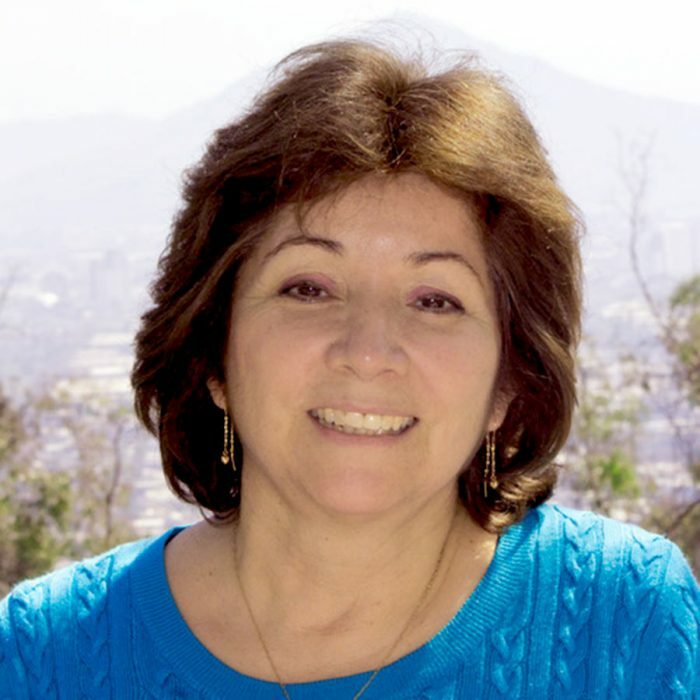 Dr. Lisette Leyton is a Biochemist from the Faculty of Chemical and Pharmaceutical Sciences, University of Chile. Dr. Leyton obtained her PhD in Sciences in the Faculty of Basic Sciences, University of Chile. She is currently a Professor of the Faculty of Medicine, University of Chile and also the Academic Secretary of the Committee of the Postgraduate Program in Biomedical Sciences of the same Faculty. 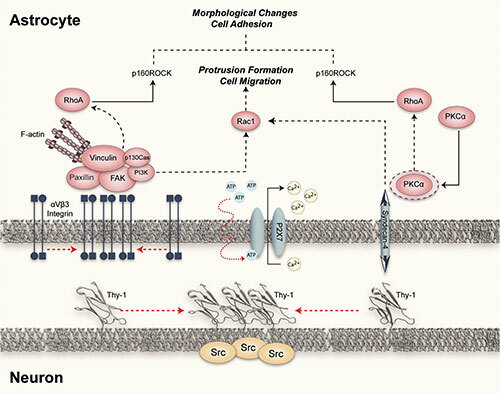 Signal transduction pathways triggered by cell-cell and cell-matrix interactions. Rho GTPases involved in cell adhesion and migration. Our model includes neuron-astrocyte interaction, its function in astrocyte activation (morphological changes, adhesion and migration) and neuronal cell death under pro-inflammatory stimuli. Astrocytes are ubiquitously present throughout the brain and intimately associated with neurons. Upon injury or in response to inflammation, astrocytes are activated, migrate, increase in size and participate in the formation of the glial scar. In doing so, the glial scar generates a non-permissive environment for neuronal regeneration. Molecular mechanisms responsible for the lack of neuronal regeneration in the adult CNS are still unclear, possibly due to the participation of multiple inhibitory cell-cell, as well as cell-matrix interactions. Our interest focuses on an interaction described initially by our group, between Thy-1, an abundantly expressed neuronal surface molecule, and its reported astrocyte ligand/receptor, (aVb3) integrin. Our initial data provided evidence indicating that Thy-1 clusters a β3-containing integrin in astrocytes to induce tyrosine phosphorylation of focal adhesion proteins (Leyton et al., 2001), RhoA activation (Ávalos et al., 2002, 2004) and the formation of focal adhesion and stress fibers. Focal adhesions anchor stress fibers to the plasma membrane, contain multiple structural, signalling and adaptor molecules and are implicated in cell migration, growth and differentiation. Results obtained indicate that αv integrin forms an αvβ3 heterodimer in astrocytes and both integrin subunits are required for its association with Thy-1. Using the Surface Plasmon Resonance technique, the interaction was shown to be direct and although there are many molecules that mediate neuron-astrocyte association, we demonstrated the requirement of Thy-1-integrin interaction to induce astrocyte adhesion to the extracellular matrix (Hermosilla et al., 2008). Additionally, we have shown that Thy-1-induced RhoA activation, as well as focal adhesion and stress fiber formation require an additional interaction with the proteoglycan syndecan-4, as evidenced by silencing syndecan-4 expression. Furthermore, lack of RhoA activation and astrocyte responses in the presence of a PKC inhibitor or a dominant negative form of PKCα, implicated PKCα and RhoA activation in these events. Therefore, Thy-1 requires both αvβ3 integrin and syndecan-4 engagement to stimulate astrocytes via PKCα and RhoA-dependent pathways (Ávalos, et al., 2009). In addition, the Thy-1 heparin-binding site has been identified and mutated. Interestingly, the mutant neither binds to heparin, nor induces RhoA activation, nor induces FA formation in astrocytes (Ávalos, et al., 2009). Finally, since PKCα activation is calcium-dependent, we studied whether calcium elevation was due to extracellular calcium influx via ATP-activated P2X7 receptors. We documented that αvβ3 integrin engagement in astrocytes by neuronal Thy-1, triggers ATP release that activates P2X7 pore-forming channels, permits calcium entry and increases intracellular calcium levels. All these events are required for FA formation in astrocytes. These results uncover a new finding concerning Thy-1 action by identifying a functional link between αvβ3 integrin and P2X7 receptors in cellular adhesion (Henríquez, et al., 2011). All these signaling events are temporally regulated and the prolonged stimulation with Thy-1 leads to disassembly-assembly of focal adhesions in a dynamic process that induces astrocyte migration in a PI3K and Rac1-dependent manner (Kong, et al., 2013). Our most recent data indicates that αVβ3 integrin acts as a ligand for Thy-1 that upon binding not only restricts the growth of neurites, but also induces retraction of already existing processes by inducing Thy-1 clustering and recruitment of Src (Herrera-Molina, et al., 2012). These observations argue that Thy-1 functions in a bimodal fashion, as a receptor on neuronal cells and as a ligand for aVb3 integrin on astrocytes. Since Thy-1 is implicated in the inhibition of neurite outgrowth, signaling events in astrocytes are likely to play an important role in this process. Understanding such mechanisms should yield insights to astrogliosis, a process triggered in astrocytes following brain injury that precludes neuronal regeneration. These studies are expected to yield a better understanding of molecular mechanisms controlling neurite outgrowth and astrocyte function. Such insights are of fundamental interest to brain physiology in general and nerve regeneration in particular. A Cárdenas, et al., Signaling pathways involved in neuron-astrocyte adhesion and migration. Current Molecular Medicine 14(2):275-290 (2014).